Your Daily Dose of Sabino Canyon: Who's Abert? Abert's Towhee pairs generally remain bonded for life. Mitochondrial DNA analysis indicates that of the three brown towhees of the American Southwest, California and Abert's are the most closely related, even though California and Canyon towhees were once considered a single species. Abert's Towhee was named by Spencer Baird in 1852 for Lt. James William Abert, who obtained the first specimen. 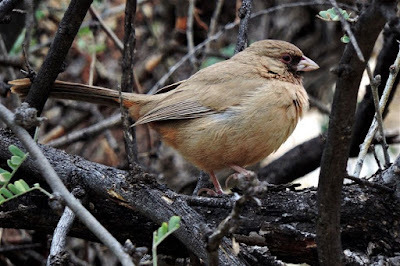 The oldest Abert's Towhee on record was at least 8 years and 7 months old, when it was recaptured and rereleased during a banding operation in Arizona.